The final day of the 1875 base ball season was one of those rare occasions when the weather matched the mood, not just of the game, but of the entire season. Conditions at the Boston Red Stockings’ grounds on the next to the last day of October were described by the Boston Evening Journal as “cold and cheerless,” “raw,” and “disagreeable,” reason enough to limit the crowd to a “few hundred spectators.”1 The dismal weather, however, was not the only reason the Red Stockings faithful found something else to do on that gray Saturday afternoon. After all, the weather wasn’t that much better the day before when the Boston and Hartford clubs played the first of a home-and-home set in the Connecticut capital, but with a crowd estimated at 2,000 in attendance. The Connecticut fans were rewarded for their perseverance, witnessing a come-from-behind 9-8 win, the home team’s first win in nine outings against the Red Stockings.2 Hartford’s lack of success against the defending National Association champions was hardly unique and that too helped explain the lack of excitement and energy at the next day’s match in Boston. Hartford was not alone, however, in faring poorly against the Red Stockings. Boston’s record against the six teams immediately below them in the standings was a resounding 48-7. None of this was surprising, given Spalding’s 54-5 record with a 1.59 ERA, not to mention a batting order with six hitters over .300 and a team batting average of .321. It’s no wonder Boston finished the season with a 71-8-3 record, 18½ games ahead of a Hartford club that had a solid .659 winning percentage of its own. Also not surprisingly, a league so dominated by one team was not a healthy one, to the point that only five teams finished the season. A perceptive observer attending the final game or even reading about it in the newspaper might have wondered if the National Association would survive. Any such ponderings would prove prophetic when William Hulbert of the Association’s Chicago club took not only Boston’s four stars, but the five surviving Association franchises into the new National League. 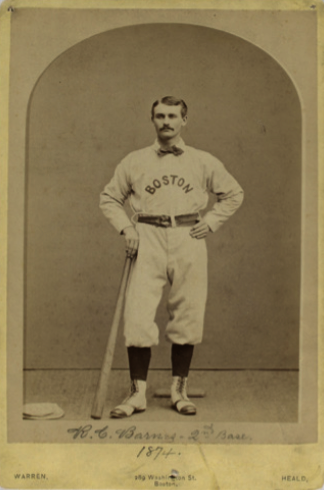 Throughout almost all of the National Association’s brief existence, the Boston Red Stockings had been the league’s most dominant team and while their last game was no classic, it was fitting that Boston won the Association’s not so grand finale. 1 Boston Evening Journal, November 1, 1875: 4. 2 Boston Globe, October 30, 1875: 5. 3 William J. Ryczek, Blackguards and Red Stockings: A History of Baseball’s National Association, 1871-1875 (Wallingford, Connecticut: Colebrook Press, 1992), 216. 4 Ryczek, 182; Boston Globe, November 1, 1875: 3. 5 Boston Globe, November 1, 1875: 3. 6 Hartford Courant, November 2, 1875: 2. 8 Hartford Courant, November 16, 1875: 2.